I recently read of an early balloon ascent in Halifax in an extract from the diaries of Anne Lister, of Shibden Hall. This event took place on April 19, 1824, when Charles Green, famous English aeronaut and balloonist, made an ascent from the Piece Hall. 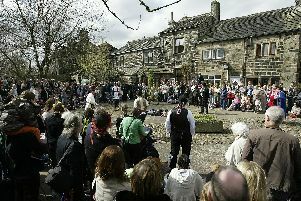 The enormous interest the event attracted in Halifax and the surrounding area is vividly brought to life by Miss Lister, who wrote: "Off to Halifax about 1.45. The road was crowded with people. Mr Green ascended at 4.30. The balloon went up steadily and beautifully, and remained in sight twenty minutes. "I returned up the Old Bank and got home about 5.15. I had no idea what a business it would be. I had to wind and push my way through one continuous crowd from Talbot Inn to nearly the top of the Old Bank. "The people were returning to the town from the hills where they had assembled, some said to the number of 50,000, to see the balloon. The High Sunderland range, Bairstow, and Beacon Hill range were beautifully studded with spectators. "The sight of these was as well worth seeing as that of the balloon. The day was remarkably favourable; people came from far and near, and few who could leave home were left behind." Charles Green landed safely later that evening at Hornby Castle, near Bedale, and said he "never had a more pleasant excursion". She added on the 20th: "He is said to have taken 400 yesterday. Admittance to the Piece Hall galleries was 2s 6d and to the area 1s." And 13 years later, on October 31, 1837, the mistress of Shibden Hall noted in her diary: "About 4.30pm Ann (Walker) and I and the servants all saw Mrs Graham in her balloon... the parachute was like a black frock." Margaret Graham and her husband, George, were perhaps the most famous English balloonists in the 19th century, making ascents on many public occasions, such as to commemorate the coronation of Queen Victoria and during the Great Exhibition of 1851, in London. But there was an unmanned balloon ascent from the Piece Hall very much earlier. The Leeds Intelligencer of April 20, 1784 reported: "A large balloon, containing about 700 gallons of inflammable air, was discharged from the Piece Hall, Halifax, on Monday the 12th inst at 40 minutes past three in the afternoon. "A very respectable body of spectators were present who expressed great satisfaction on the occasion. "It was detained for some time, by means of cordage, to gratify the company, and when dismissed into the atmosphere it rose to an astonishing height and was visible for twelve minutes. It would have borne a considerable weight and for want of some appendage to keep it steady, the wind being rather high, it is supposed a breach was made in the silken enclosure, which occasioned the balloon to descend much sooner than was expected it was taken up at Kirk-Heaton, ten minutes past four." Unfortunately the name of the demonstrator in this occasion is not given. But the event is most significant as it was then not much more than ten months since the Montgolfier brothers had given their first public demonstration of a lighter-than-air machine at Annonay in France.